The Republic of Yemen or Yemen is a nation in the Middle East. It is the old North Yemen and South Yemen, in the south of the Arabian Peninsula. It borders Saudi Arabia and Oman on the north and the east. To the south is the Guardafui Channel and Gulf of Aden, and to the west is the Red Sea. 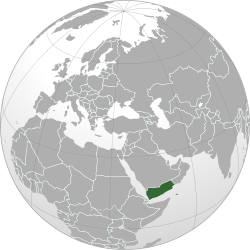 Yemen owns the island of Socotra (217 miles) to the south off the coast of East Africa. A person or thing from Yemen is called Yemeni. Yemen's capital city is Sana'a. Yemen is the origin land of all Arabs in the Middle East. In ancient times, Yemen was an important center of trade and power. Many powerful kingdoms were in Yemen, including the Sabaeans. Yemen was important in the trade of spices as well. It was known to the ancient Romans as Arabia Felix ("Happy Arabia" in Latin). They called it Happy Arabia because the area was so beautiful and powerful. In the 700s, Yemenis were among the first to join the new religion Islam. Since then, Yemenis have been staunch Muslims who were in the forefront of all Islam conquests. Men whose ancestors came from Yemen ruled Al-Andalus (Muslim Spain) for centuries. The Ottoman Empire took control of North Yemen, and the British Empire took South Yemen, in the early 20th century. The two parts were united in 1990 and later fought civil wars. The latest one started in 2015. Some famous people including former President Ali Abdullah Saleh were killed, and thousands died of hunger. Today, Yemen has over 20 million people. Most of them speak Arabic. Yemen is in Western Asia. It is on the southern half of the Arabian Peninsula. A number of Red Sea islands, including the Hanish Islands, Kamaran, and Perim, as well as Socotra in the Arabian Sea, belong to Yemen. Many of the islands are volcanic. For example, Jabal al-Tair had a volcanic eruption in 2007 and before that in 1883. The highest point in Yemen is Jabal an Nabi Shu'ayb. Yemen is one of the poorest and least developed countries in the Arab World. There is a 35% unemployment rate, which means only 35 out of every 100 people in the labor force don't have a job. As a result of the 2011–2012 Yemeni uprising, the constitution of Yemen was rewritten. New elections were to be held in 2014. Some areas are controlled by armed militant groups. On 23 January 2015, the President, Prime Minister and Cabinet resigned. War continued, with Saudi Arabia and Iran supporting different sides. As of February 2004, Yemen is divided into twenty governorates and one municipality called "Amanat Al-Asemah". The governorates are divided into 333 districts. The districts are divided into 2,210 sub-districts, and then into 38,284 villages (as of 2001). Yemen has about 24 million people according to June 2011 estimates. 46% of the people are under 15 years old. Yemenis are mainly of Arab origin. Arabic is the official language. Religion in Yemen is mostly of two main Islamic religious groups; 53% of the Muslim population is Sunni and 45% is Shiite according to the UNHCR. According to 2009 estimates, life expectancy in Yemen is 63.27 years. Football is the most popular sport in Yemen. The Yemen national football team competes in the FIFA and the AFC leagues. The country also hosts many football clubs that compete in the national or international leagues. Yemen's mountains have many opportunities for outdoor sports, such as rock climbing, hill climbing, skiing, and hiking. The coast of Yemen and Socotra island have opportunities for water sports, such as surfing, sailing, swimming, and scuba diving. Socotra island is one of the best surfing places in the world. Yemen's biggest sports event was hosting the 2010 Gulf Cup of Nations. Wikimedia Commons has media related to Yemen. ↑ 1.0 1.1 1.2 1.3 "Yemen". International Monetary Fund. Retrieved 24 April 2012. ↑ "Human Development Report 2011" (PDF). The United Nations. Retrieved 18 October 2011. ↑ "Yemen". International News Safety Institute. Retrieved 14 October 2009. ↑ "Statistic Yearbook 2006 of Yemen". Retrieved 17 October 2010. ↑ 7.0 7.1 "CIA World Factbook". CIA. Retrieved 26 October 2008. ↑ Merrick, Jane; Sengupta, Kim (20 September 2009). "Yemen: The land with more guns than people". London: independent.co.uk. Retrieved 21 March 2010.